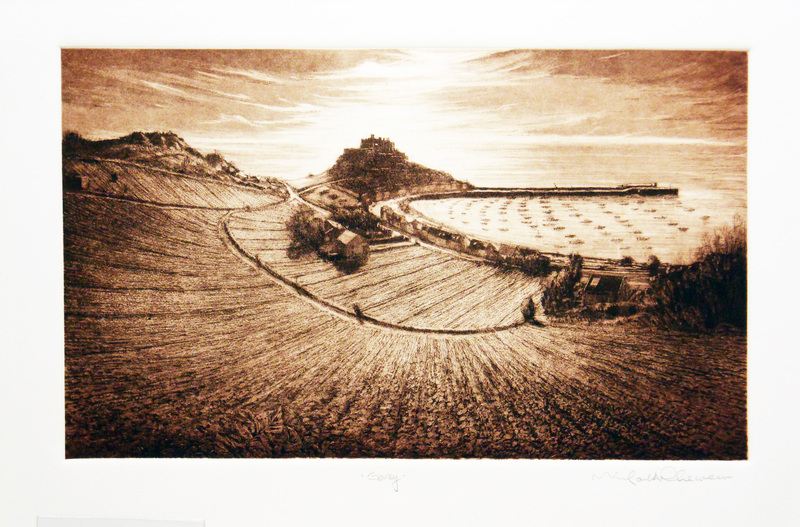 All these etchings are Price Code B.
Sizes are approximate – exact sizes available on request. Looking North from St. Ouen’s Bay the distant headland of L’Etacq marks the end of the ‘five mile bay’. This is the extreme West of the island with only America as the nearest landfall heading that direction. The Millennium Suite is available is also available with frontispiece, linen portfolio with hologram date and signature – POA. 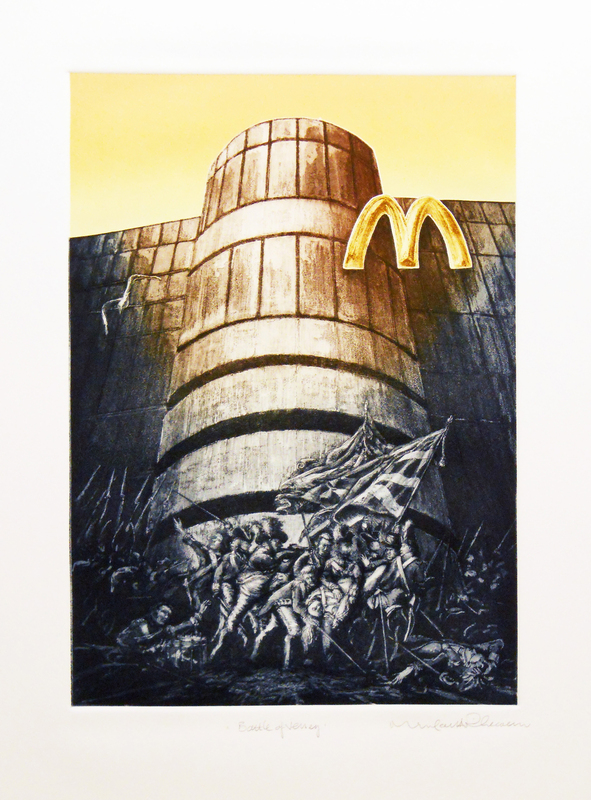 All Millennium Suite etchings are Price Code B. A view from the dolmen looking East towards St Ouens Church and the disused Mill. The strong vertical composition and scale are used to accentuate the perspective. Artists licence has been used to remove the wall which normally hides the dolmen. 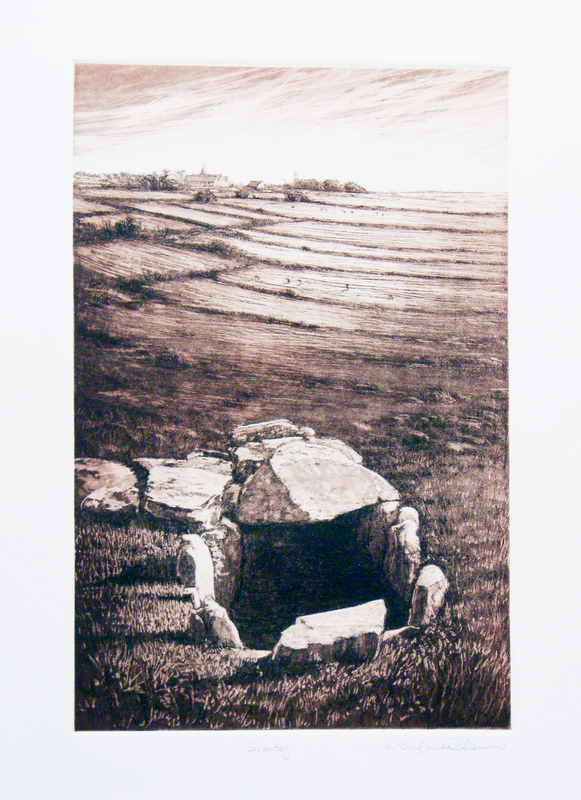 Techniques used here are ‘intaglio’ line with aquatint and drypointing, the ink is a variation on sepia. A grave, a place of worship and a mill – that which could be said to represent mankind over 2000 years. Declining symbols of past, present and future. Looking West – the Pinnacle rock dominating the vertical composition, looking down a rockstrewn cliff in the foreground with the sea reaching to the horizon beyond. The rocks have been drawn with vigour and deeply bitten into the plate and the aquatint has been used to emphasise the form and texture of the Pinnacle. To balance the strongly modelled foreground the sea has been horizontally dry-pointed. The ink is a variation on Prussian Blue as is the sea and the sky. The people reputedly reported to having lived here must have thought they had reached their pinnacle – probably as we do now – our almost total lack of knowledge of them will probably be matched by the futures total ignorance of us. 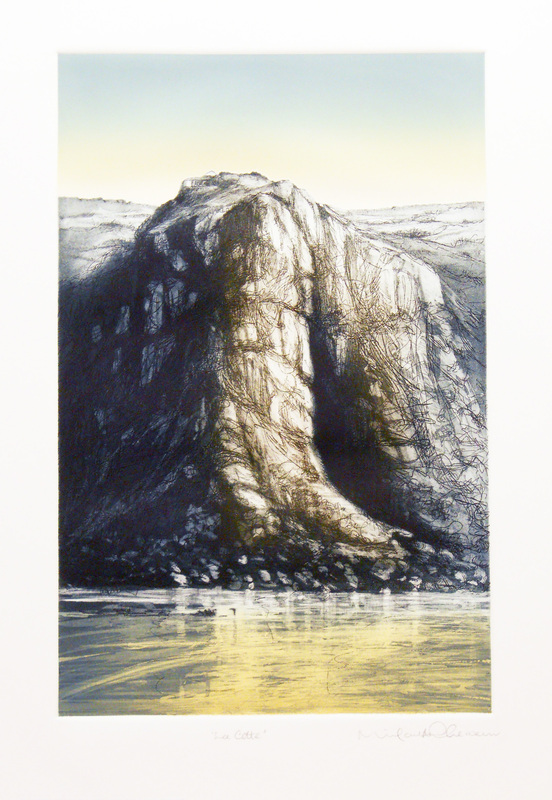 Technique as ‘Pinnacle’ but with softly blended colour sky to emphasise the rugged texture of the rock and to provide reflections in the water below. Connatations of survival, the incongrous dwelling, takes of mammoths, the scale and symbolism of forms allows us many perspectives on this image. A central, vertical composition showing a composite tower form from the 20th century with an 18th century battle skirmish below. We are looking up at two airborne elements and a brightly blended orange sky. A strong aquatint has been used to render the architectural forms as concrete and the figures worked extensively in dry point. 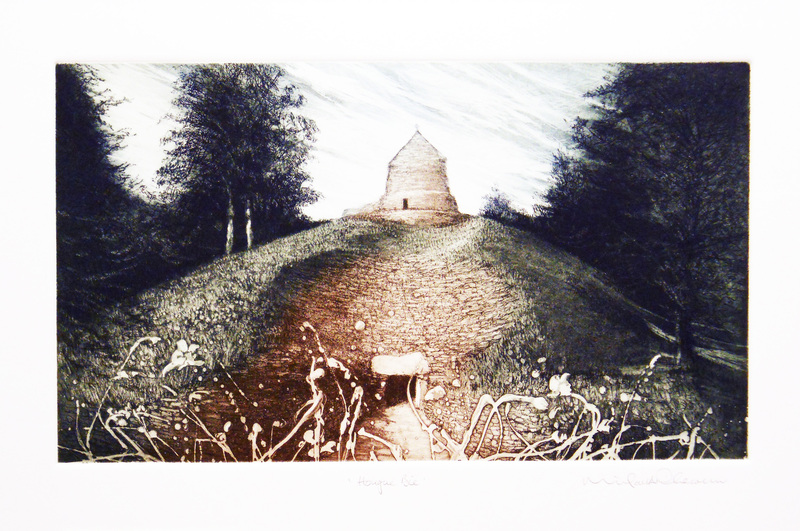 The intaglio ink is Prussian in the shadows and sepia in the light together with a vivid blend to orange in the sky. A montage of images taking many invasive forms the island has been subject to: the central tower echos banks and bunkers – the flying threats from the seagulls to Big Macs – and below in stygian gloom Major Pierson is dying – valiantly supported by the artist. Threats have always been upon us, some from without, some from within, but an island of privateers has so far, survived to deal another day. A coastal scene which foreshortens the distance to the French Coast to the North East. Children and an adult are exploring the beach bathed in golden reflections whilst on the horizon sits the nuclear reprocessing plant at Cap de la Hague bathed in a less hopeful light. Open bite has produced the contours in the beach part of the plate whilst aquatint has been used for the coast of France and the sky. Scraping and burnishing has given the light to the beach whilst drypointing has suggested the figures. The complementary colours give vitality to the foreground whilst the Prussian blue gives seriousness to the distance. Not 2000 years back but an issue for the next 2000 years. Will our beaches be safe places to explore then? The La Collette power station exhaust gas shaft is shown in its close proximity to a more historic tower designed to keep us safe. There is much evidence of this theme in the island and it will lead to a series of prints in their own right – historically little of the faith has proved warranted. A view looking West towards the entrance of the neolithic tomb showing the mound with its recently revealed stone cladding and the chapel on its summit together with its sylvan setting. 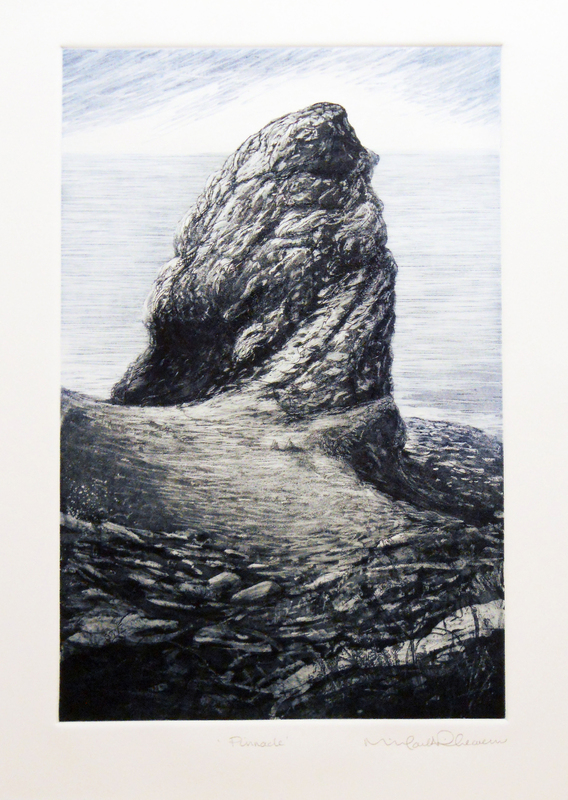 There is more emphasis on the use of aquatint to model the form of the mound and the texture of the granite. 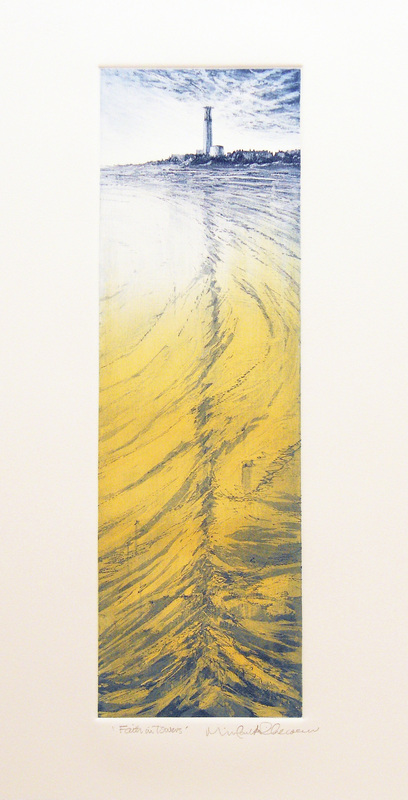 The trees have been rendered in drypoint and the plate inked ‘a la Poupee’ which means different colours of ink have been used for the intaglio or bitten part of the plate – this technique lends itself to a variation in the distribution of the colours and each pull has its own unique colouring. (This is the same for La Cotte, Battle of Jersey and Distant Drums.) Inks used are sepia, prussian and yellow added for the green – throughout the portfolio the colours have been kept to a limited palette to provide a degree of harmony. Though complementary relationships have been used where dramatic effect is required i.e. Battle of Jersey, Distant Drums and La Cotte. Once upon a time there was a folly built on the roof of the chapel – which was built without adequate foundation, but surprisingly did not collapse before its demolition are we to see history repeat itself? A view looking down from the cotils towards the North East. In the early morning light, the castle is almost in silhouette and the harbour waits quietly for the bustle of the day. Early morning view across the cotils looking Eastward. The natural amphitheatre to Mont Orgueil unfolds in dramatic perspective. The use of a single aquatint emphasises the sparkling light, forms are simplified and pattern reinforced. Printed in sepia the light emanates from the picture plane with oriental simplicity. The use of castles as safe havens is a common theme in the island – this castle was defeated by technology that confronted it from the inland high ground. Reminding us that nothing is impregnable and perhaps even the Jersey Royals could be under threat.